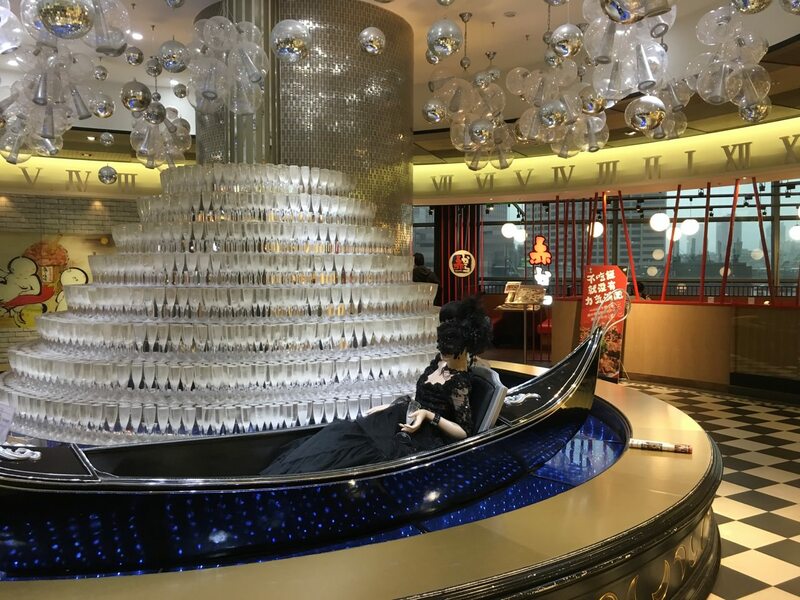 玩笑亭 (なんつっ亭) 是 ATT4FUN 4F美食餐廳, 也是台北信義區拉麵之一, 招牌拉麵是黑蒜香油叉燒拉麵. 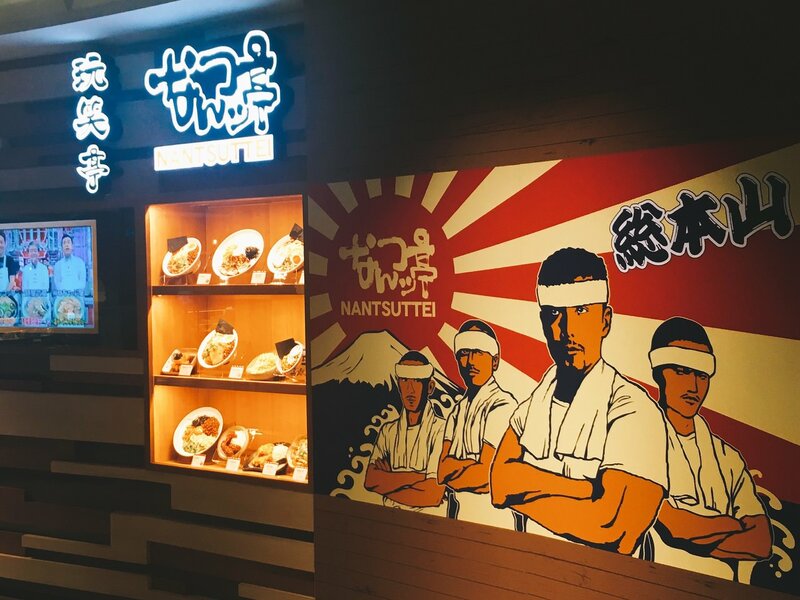 Nantsuttei Ramen is one of the restaurants at ATT4FUN. It is also one of the Xinyi District Japanese Ramens. Their signature dish is Darken Garlic Oil Ramen. 台北信義區拉麵選擇眾多, 其中包括”一蘭拉麵”, “一幻拉麵” 和 “豚骨一燈”. 2017 新開幕的玩笑亭與 “抹茶館 MACCHA HOUSE” 皆在 ATT4FUN 樓上, 只要在4 樓的甜點王國走一圈, 便看到威尼斯藝術裝飾與旁邊的玩笑亭. 餐廳內的落地窗可以看到 101 大樓. 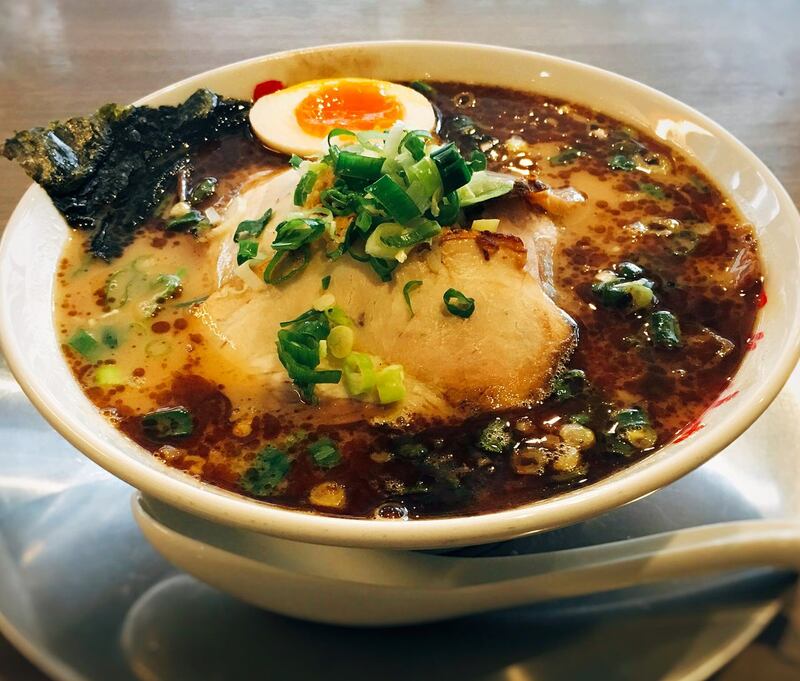 There are many ramen restaurant options at Xinyi District, including “ICHIRAN RAMEN”, “EBISOBA ICHIGEN RAMEN” and “TONKOTSU ITTOU Ramen”. The newly-opened Nantsuttei and “Maccha House” are both t the ATT4FUN. It is located near the Venice Art at 4th Floor. You can see the 101 building from the French window. 基本款的黑蒜香油拉麵 (NTD $210) 配置有一片叉燒, 半顆糖心蛋, 海苔與豆芽. 由於玩笑亭的叉燒聽說跟麵屋武藏相當出名, 我就點了升級版 (NTD $280). 拉麵湯頭色澤明顯有兩種顏色, 乳白色豚骨湯底上浮著深褐色黑蔥香油, 桌上立牌寫著 “黑蒜香油是以炸至七種不同程度的蒜片, 與純芝麻香油混和在一起“. 跟著湯頭一起喝會鹹度過高, 焦香蒜香風味蓋過其他風味. 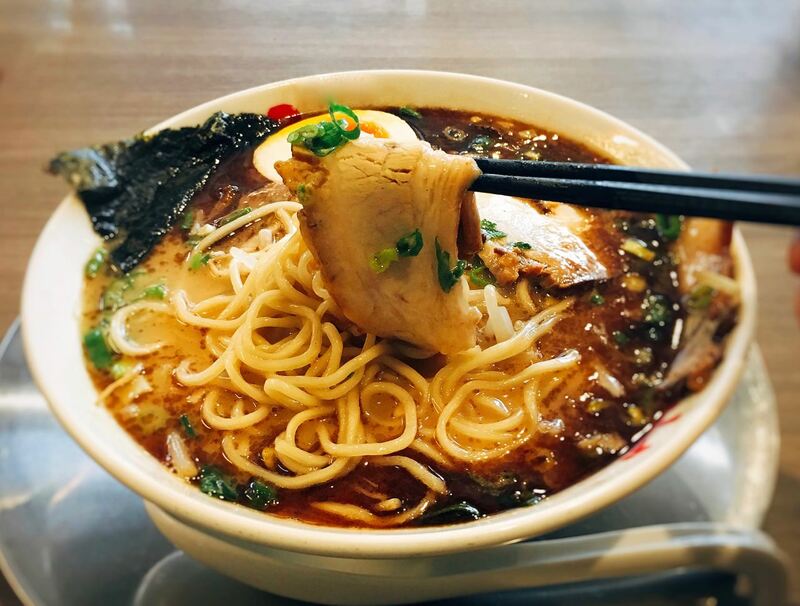 The standard version darken garlic oil ramen (NTD $210) has BBQ braised pork, half boiled egg, seaweed, and bean sprouts. The update version has more braised pork, which is NTD $280. The broth has two obvious different colors- ivory pork broth and dark brown garlic oil. The tablet stated that the garlic oil is mixed with 7-different-levels of fried garlic and pure sesame oil. If drinking the soup and oil alone, the salty level is quite high. The garlic flavor covers other flavors. 每個人可選擇麵條軟硬度, 我個人比較喜歡硬度較高的拉麵因為帶有點韌性, 但是麵條明顯較不吸收湯汁, 有點失望. 薄切叉燒則是肥瘦各半, 並不會有柴的口感, 清脆豆芽可以說是這碗麵的救星, 因為蒜香味雖然迷人, 但油脂與香油過多會過膩. 整體來說, 我認為選擇基本款會是較好的選擇. Each customer can choose the texture of the noodle. I prefer hard texture, however, it doesn’t absorb the broth. The thin sliced porks are tender. The crisp bean sprouts clear the oily taste at the tastebuds. Generally speaking, I would recommend the standard version since there will be too many sliced braised pork.